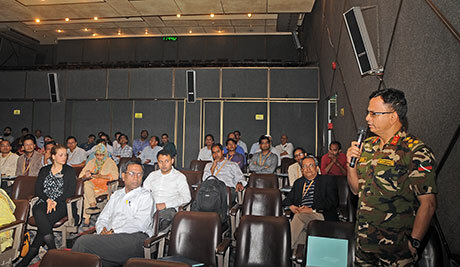 icddr,b hosted a dissemination seminar on ‘Gavi Full Country Evaluations (FCE) in Bangladesh’ to share Gavi’s ongoing work on immunisation and health systems strengthening in Bangladesh. 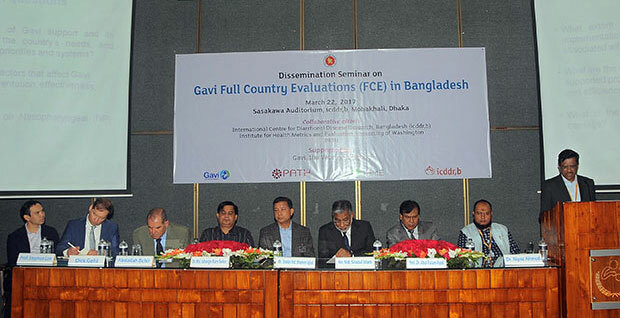 icddr,b is part of a consortium including Gavi, The Vaccine Alliance in Bangladesh with Institute for Health Metrics and Evaluation (IHME), PATH and other collaborators. Findings from a number of evaluative studies were shared in presence of senior officials from Bangladesh Government and scientists, researchers and programme managers from different external organisations at the seminar held on Wednesday, 22 March 2017. Following an overview on the FCE by icddr,b scientist Dr Md. Jasim Uddin, principal investigator of the studies, other researchers from icddr,b and Child Health Research Foundation (CHRF) shared updates on health systems strengthening, health facility assessment; impact assessment of pneumococcal conjugate vaccine (PCV); analysis of financial resources for the expanded program on immunization (EPI). Professor Stephen Lim of IHME, University of Washington shared cross country findings and policy implication of Gavi support in Bangladesh and beyond. Professor Dr Abul Kalam Azad, Director General, Directorate General of Health Services (DGHS) and Mr Sheikh Mohammad Shamim Iqbal, Director General, Directorate General of Family Planning (DGFP) and Dr Md. Jahangir Alam Sarker, Director, PHC and Line Director, MNC&AH attended the programme. 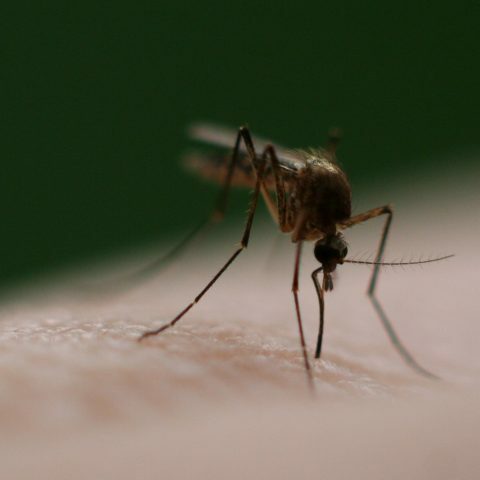 They felt that the study findings are useful for policymakers and programme managers of MOHFW for immunisation and health systems strengthening in Bangladesh. Mr Abdallah Bchir, Head of Evaluation Policy and Performance and Mr Dirk Gehl from Gavi Secretariat, Geneva also attended the event chaired by Dr Niyaz Ahmed, Senior Director, Laboratory Sciences and Services Division.